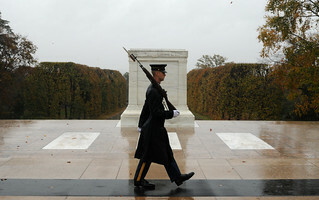 You may have already seen this photo which has gone viral today because it purports to show the scene at the Tomb of the Unknowns in Arlington, Virginia, during Hurricane Sandy. However, The Old Guard reports that this photo was taken back in September. They have have posted a few photos on Facebook to show today's conditions there.